Students getting ready for the new school year will want to check out Acer's newly spruced up, 14-inch Aspire E series laptop. In the world of affordable laptops, Chromebooks reign supreme over most Windows laptops and has been a wake-up call for manufacturers to step up their game. Cheap notebooks are getting better and better, with the HP Pavilion x360 as one major stand out 2-in-1 laptop on the cheap. Now, in the traditional notebook space, Acer is hoping to catch some eyes with its uniquely crafted Aspire E14. The first time you touch this 14-inch laptop, you'll immediately notice it is uniquely textured to feel like a piece of fabric. Unlike most other laptops, the Acer Aspire E14 features a 3D printed lid and bottom panel that give it a distinct look and feel of a thousand layered threads. 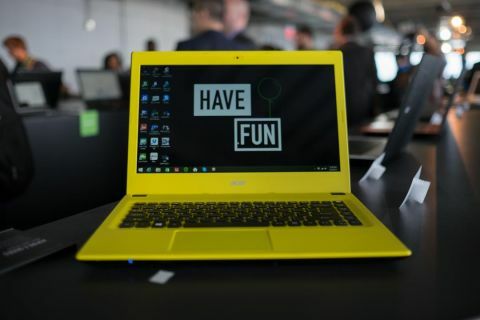 In reality, though, the laptop's sides are just made of finely extruded plastic that helps make the laptop feel more premium than the usual glossy finish on an affordable notebook. Even better, during all my manhandling with the sample units, it seems the 3D printed material is adept at avoiding greasy fingerprints. The exterior of the Aspire E14 isn't the only part that's been given a textured finish. The palm rest also features a tiny, diamond cut pattern that felt nice and rippled against my palms. Overall, this isn't a cheap feeling laptop and that comes at a surprise considering it's very low starting price point of $379 (about £250, AU$485). Aside from the laptop's distinct exterior, pretty much everything else about the Aspire E14 is standard fare. It has a 1,366 x 768 resolution display, though you can upgrade to a higher-resolution 1,080p panel. Acer is also offering up the same display choices for a 15-inch model of its E-series. Meanwhile, users can also pick up a 17-inch variant with either a 1,600 x 900 panel or a full HD display. Additionally, the laptop I was able to play with came packing a 2.2GHz Intel Core i5-5200U processor with 16GB of RAM. The Acer Aspire E14 can also be configured with lower spec processors from Intel's Celeron or Pentium lineups. There's the option to also go with an AMD CPU, from its A4 to A10 ranges. Despite the high-end configuration of my hands-on unit, the Aspire E14 still felt a bit sluggish while tabbing between applications. However, one Acer spokesperson was quick to note the units at the New York event were pre-production models, chalking the performance hitches up to the units being on for several hours. One inescapable shortcoming is it has an incredibly glossy screen that reflects light with a very unattractive sheen. The real shame is the screen's reflectiveness prevents you from fully appreciating how colorful it is. As for handling, the touchpad feels great and clicky with accurate tracking, thanks to Microsoft's hand in developing Precision Touch for all Windows systems. Similarly, the keyboard is more than up to task without the slightest hint of flex, which should help it survive any marathon essay writing sessions. The Acer Aspire E14 is a compelling package for $379 (about £250, AU$485), but those in the US won't be able to get their hands on it until July. That's a long lead time, and the competition in the affordable laptop space is only mounting with amazing Chromebooks - including the Chromebook 15, which Acer itself made. Those in Europe, the Middle East and Africa are a bit luckier with Acer's E series arriving this May. China will get first dibs Acer Aspire E14 and the rest of the E-Series this month. For now, I'm fairly pleased with the Aspire E14, but I'm skeptical as how well it will perform against equally-excellent Chrome OS options and other affordable notebooks running Windows, such as the 15-inch HP Pavilion. The Acer Aspire E14 is a step in the right direction, but it will have to be even more than that come July to survive a season ripe for cheaper, snappier Chromebooks.